I got the map from dailyinfographic.com via a scoop.it post to Facebook from Adelina Silva’s scoop.it page. 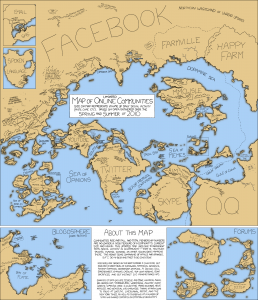 I like fantasy maps and concept maps so this is great. 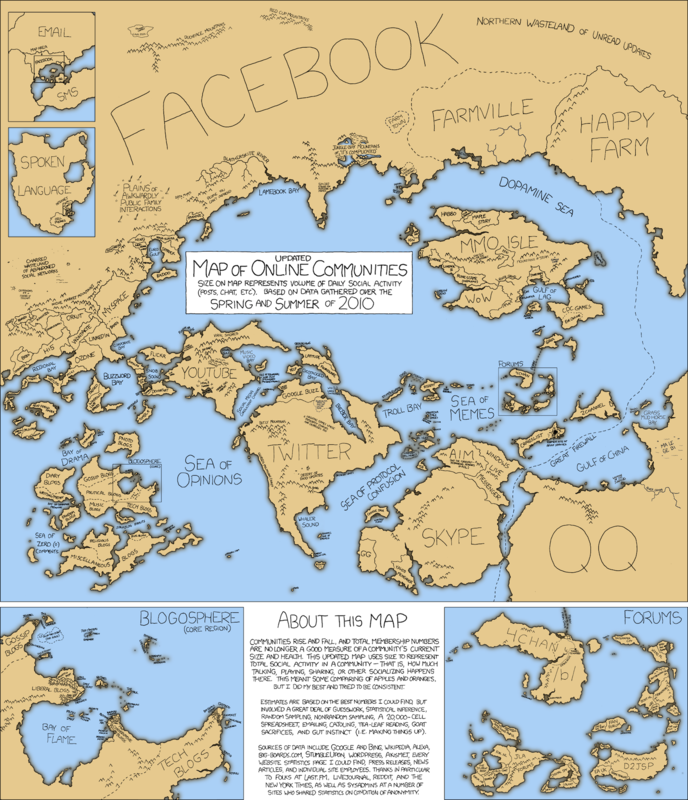 Picturing networks of online communities as a world is entirely appropriate. The prominence of Facebook is not surprising. When the Internet burst onto the scene, some thought it would change education by allowing students to access information far beyond classrooms and school libraries. But this access came with a challenge—students were faced with hyperlinked text that sent them into distracting territory. The problem of being distracted while learning is personally relevant. It’s what I do. Following one learning path I’m led down several others that are tangential to my original intention. This personal habit long pre-dates the advent of hyperlinks, going back to college days when I would browse through the library making connections that were more interesting that the reading necessary to get the essays answered quickly and effectively. This is a habit that I’ve taken into the rest of my life and that has been intensified by the Internet. The Internet is both a sea of knowledge and a sea of distraction. It is possible to be lost for hours and days to no productive purpose. There are treasures found but also lots of dross and even the treasure will be too much to carry. What we need to practice is not so much the art of navigating to the objects of original purpose, but the art of limiting the time spent on journeys or side trips of serendipitous discovery. According to this chart from flowtown.com I shouldn’t be using Twitter. I rarely post and rarely check Twitter for posts for people/organisations I’m supposedly ‘following’. Admittedly there’s usually something of interest to click on when I do look but is this enough? In itself no but perhaps there is another potential to Twitter inherent in it being part of an ‘information stream’. Using Twitter is or can be stepping into that stream becoming part of an instant zeitgeist. Whether anyone sees my post is irrelevant. It takes no time to post. I will post a link to this reflection on Twitter and Facebook by just clicking a couple of icons. Most people who ‘follow’ me of Twitter or are friend on Facebook will not see this, fewer will read it. Never mind it’s just being thrown out there into the Stream (note the capitalisation). Maybe there’s an insight of sorts here. Twitter, Facebook and our other many-to-many communication media have become a communications Stream and we can choose to contribute to that. According to the diagram most of us should get off Twitter and I would right now if I took myself or Twitter more seriously. I don’t. What I possibly take seriously is the notion that all this is part of a social evolution and that Twitter, Facebook, blogs and the rest form a collectively authored whole that has value because of its inclusiveness as much as for any creative worth that can be found in individual contributions. Whereas once the majority were denied the opportunity to contribute to art and literature because of our mediocrity we are now contributing to, not just a magnum opus but to THE Magnum Opus.